Beetiful designed the book cover to Sixteen Months by Cara Ward. Sixteen Months is the third book in the Weighting to Live series. 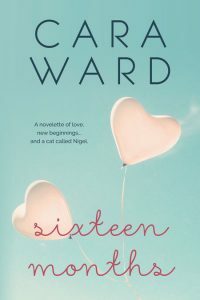 Get Sixteen Months by Cara Ward today! In 2014, as part of NaNoWriMo, she wrote the first draft of Weighting to Live. The following February she published it under the pen name Lily Divine. She then went on to write two sequels: Changes, a book of short stories and Sixteen Months, a novelette. In 2017, Cara decided to republish them under her own name, adding to the series in 2018 with the short story Plus Uno. In 2017 she published her first non-fiction book Curing my Incurable Eczema, the story of her battle with eczema and red skin syndrome. Every Trich in the Book is Cara's first book published with Trigger in 2018, documenting her recovery from trichotillomania.